The world’s largest animals get snarled in every kind of sea gear that has rope—mooring lines, gillnets, shrimp pots, anchors. Scott Landry figures out how to wrestle them free. THE GOBBLER GUILLOTINE WAS DESIGNED IN TEXAS for shooting turkeys. To the best of anyone’s knowledge, Scott Landry is the only person who has successfully used the four-bladed arrow to shoot at whales on the high seas. Landry’s choice of weapon is a far cry from the traditional heavy iron harpoon, but it has proved effective for his goal: freeing the animals from yards of tangled rope and fishing gear. Landry will tell you that he knows little about hunting turkeys. But the 42-year-old marine biologist has repurposed tools of that trade for a different kind of hunt. He is the director of a response team that extracts whales from the handcuffs of commercial fishing gear in the heavily trafficked waters along the Eastern Seaboard. Since 1998, he has helped invent techniques to free whales, predominantly right whales and humpbacks. Fishing line kills the mammals through systemic infection from cuts—stray lines eventually slice into the skin, leaving open wounds, and can lead to a slow, brutal death. When the injuries don’t kill outright, they can impede eating and reproducing. Disentanglement is particularly critical for the endangered North Atlantic right whale, whose population is, at best estimate, around 490. In the last few years, a record number of calves have been born in the waters off the Atlantic coast—21 cataloged for 2009 and 2010—but a record number of entanglements have also been reported. Research shows that nearly 70 percent of right whales have been snared by rope at least once. 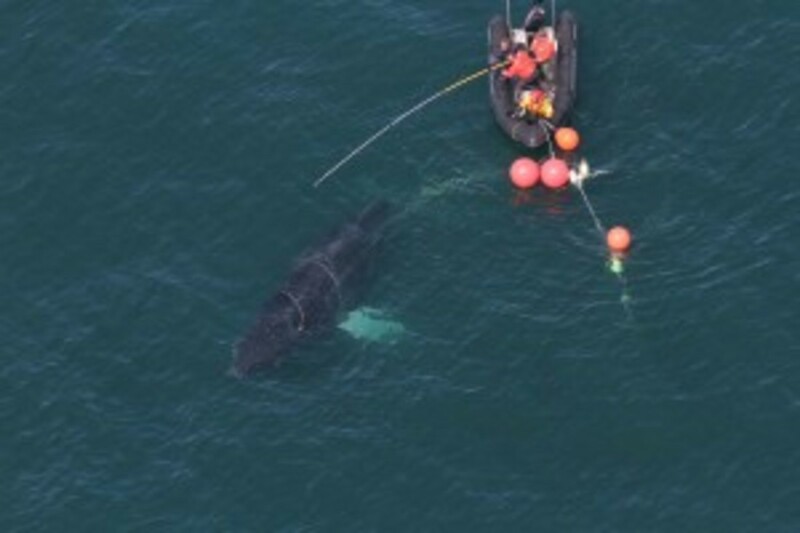 In 2011, entanglements were the cause in two of the five confirmed right-whale deaths, and odds are that many more fatal cases went unobserved. At its current death rate, the right whale’s population is unsustainable. “Many of the techniques we’ve come up with over the years were born out of sheer frustration,” Landry told me when I visited his office at the Provincetown Center for Coastal Studies, just beyond the mouth of the windswept Cape Cod Bay, on the Atlantic’s north-south whale highway. 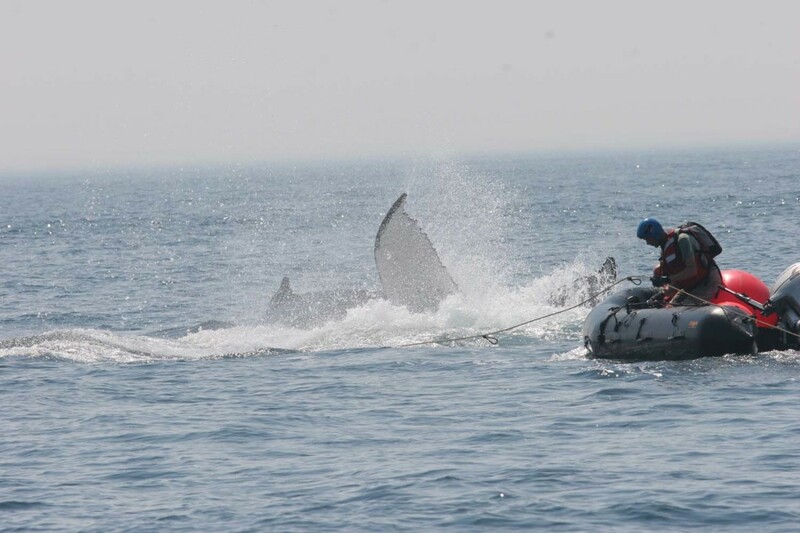 The day before we met, he and his three-member team had been on a rescue mission to extract a right whale, No. 3821, from a buoy line. The young whale had escaped, but with rope still looped around its head. If they didn’t manage to track and free the animal in the coming days, it could easily die, Landry said. The right whale is a stocky species, weighing up to 70 tons, or 140,000 pounds, and can swim only 10 miles an hour. But it can dive down to 1,000 feet and stay underwater for 40 minutes. Though the team’s success rate with humpbacks is about 90 percent, with the more evasive, and more endangered, right whale, it is closer to 50 percent. Landry paid his way through his anthropology degree at the University of Massachusetts Amherst by working on whale-watching boats, since it was a way to get close to wild animals in New England. He went on to get a graduate degree in scientific illustration at the University of California, Santa Cruz. In 1998, he found a post as a naturalist at the Provincetown Center for Coastal Studies. The center has been conducting research on large whale populations since the 1970s. Its Gulf of Maine Humpback Whale Catalog is one of the longest-running and most detailed studies of a large whale population, documenting birth, death, and everything in-between. 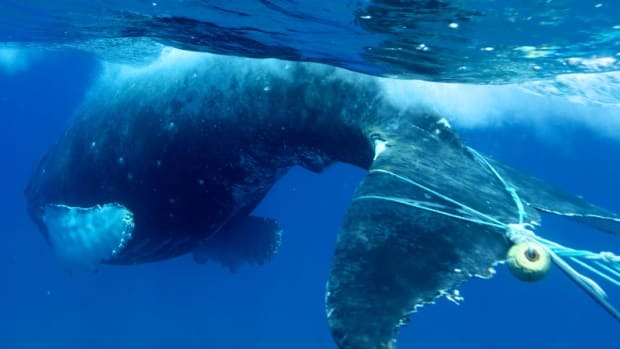 Landry began a seven-year apprenticeship with the center’s entanglement team, one of the first efforts to figure out how to rescue whales fouled in fishing line. Working as far as 100 miles offshore, Landry’s team faces serious risks. A tied-up, disoriented whale doesn’t know it’s being helped—and it doesn’t want to stick around. “We get asked all the time, ‘Well, why don’t you just jump in the water?’” he says. Swimming close to the panicked animals is impossibly dangerous. And a single 50-ton—or 100,000-pound—whale can drag a 50-foot fishing boat, its two diesel engines going at full throttle, backward. Maneuvering tiny rafts around whales on the high seas; rigging angled knives to 30-foot window-washing poles to cut rope; and tiring the animals out with flotation devices to bring them to the surface (a practice called “kegging”)—all are techniques with origins in whaling. Landry points out: who knows more about how to get close to a whale than a whaler? And although Landry has science on his side—digital tagging and sedation—he’s found that modern techniques are not always as reliable as old sailor’s tricks. Sedation requires a veterinarian experienced with whales—a rare breed in themselves, he says. Landry first thought to try out the Gobbler Guillotine after a particularly frustrating rescue. “A pole wasn’t working, and I told my team that I was going to take every knife we had and throw it at the whale,” he told me. “And then I thought, Well, why don’t we throw something?” Landry and his team had already been using crossbows to collect biopsies. It took two years to get approval from the marine-permit office to try the technique. 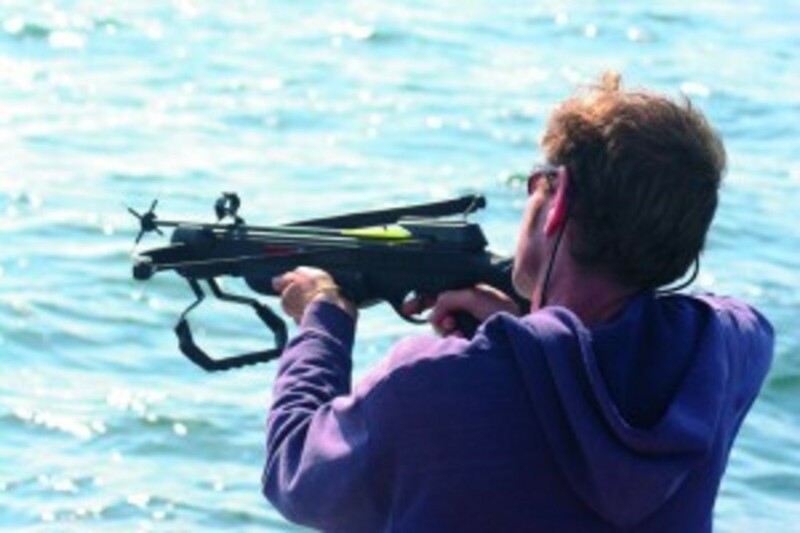 The first time Landry fired the crossbow, he freed a 30-ton right whale from 50 feet of rope wrapped around its jaw. He got lucky. In 2009, new federal regulations went into effect requiring lobstermen to ground the lines connecting each lobster trap to the sea floor. The idea is that the whales are less likely to swim into a mess of pots if the lines connecting them are flat on the sea floor. Landry doesn’t yet have enough data to know if the change has helped. “It’ll be at least a few years before we reevaluate this,” he says. Because the Center for Coastal Studies conducts research on several whale species in the Gulf of Maine—a large span of water between Cape Cod and Nova Scotia—its field season is pretty much year-round. Right whales come into the area between January and May, and humpbacks, fin whales, and minkes arrive between April and January. During the right-whale season, research teams take to the air and sea, conducting population surveys from a Cessna and taking weekly water samples where whales feed. David Mattila, who was Landry’s mentor for 10 years, now works for the National Oceanic and Atmospheric Administration and is on detail with the International Whaling Commission, advising its 89 member nations on entanglement response. “Everyone now is at least starting from the same place—even countries that might not otherwise agree on many aspects of whale conservation and management,” Mattila told me. He had just returned from talking to government officials and training on-water response teams in Brazil and Argentina, where more and more whales are getting ensnared. He and Landry have worked together with teams as near as Canada and as far as South Africa and Australia. While Landry and Mattila are glad to see teams around the world become skilled at cutting whales free of fishing line, it isn’t the ultimate goal. “We always thought we could catch fish without catching whales,” Landry says. Nearby, at Boston’s New England Aquarium, Tim Werner directs the Conservation Engineering Program, which works with fishermen, engineers, and marine biologists to design experimental fishing gear and techniques to lower entanglement risk for whales, sea turtles, sharks, and the like. A simulation produced by the New England Aquarium&apos;s Conservation Engineering Program and engineers at Duke University shows a right whale caught up in fishing lines. Data on scarring from around the world—much of it provided by Landry’s team—are being examined for correlations between certain types of rope and the severity of scars. 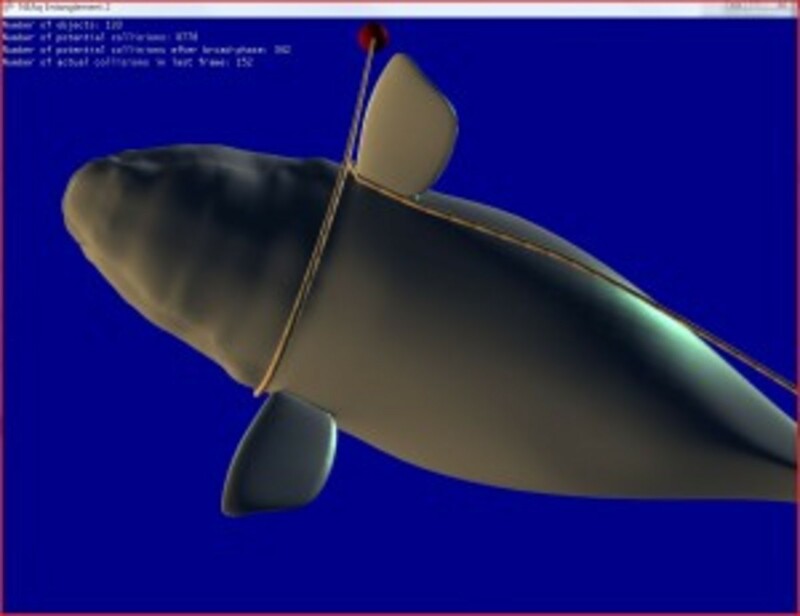 Werner’s program has partnered with engineers at Duke University to create a digital simulation of a right whale plowing through fishing gear. The organization has also been running experiments in the waters off Cape Cod to see whether whales avoid rope of certain colors or luminosity. And Werner’s team of engineers and scientists is researching the development of a lobster trap whereby, instead of having to attach a pot to a line, a fisherman could use a transmitter to signal the pot—through “acoustic release technology”—to rise to the surface, much the way a key fob works to unlock your car. No ropes. No tangles. IN THE MEANTIME, the whale wranglers continue to be the first and last line of defense. I spoke to Landry a week after my visit to Provincetown, and he had good news and bad news. The bad news: he had just gotten off a phone conference on marine-mammal conservation and research; he would likely lose 30 percent of his federal funding—$66,000—this year. The Center for Coastal Studies would have to go to state representatives and NOAA to find the budget to keep working. But right whale No. 3821 was swimming free. After two attempts, Landry’s team had cut the loop of rope from its head. It was heading for open water, unencumbered. For now.